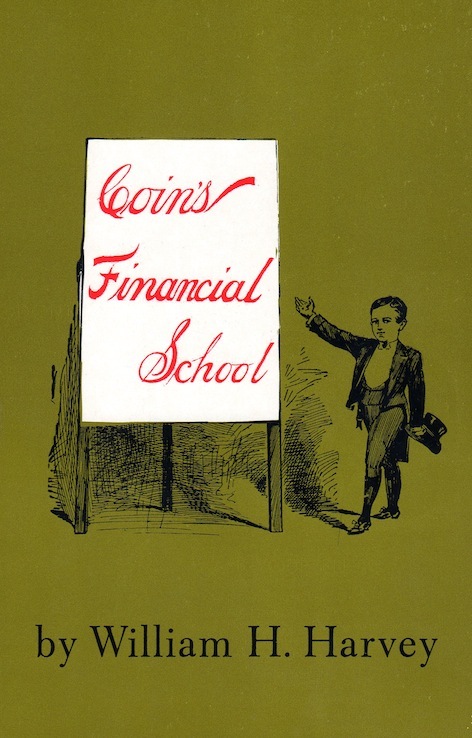 “Coin's Financial School” appeared over a span of years after 1894 printed by William Harvey's private ‘Coin Publishing Company’ in Chicago. The copy chosen for reissue here is the earliest complete copy in Harvard University, received 31 Mar 1895. “So much uncertainty prevailing about the many facts connected with the monetary question, very few are able to intelligently understand the subject. Hard times are with us; the country is distracted; very few things are marketable at a price above the cost of production; tens of thousands are out of employment; the jails, penitentiaries, workhouses and insane asylums are full; the gold reserve at Washington is sinking; the government is running at a loss with a deficit in every department; a huge debt hangs like an appalling cloud over the country; taxes have assumed the importance of a mortgage, and 50 per cent of the public revenues are likely to go delinquent; hungered and half-starved men are banding into armies and marching toward Washington; the cry of distress is heard on every hand; business is paralyzed; commerce is at a standstill; riots and strikes prevail throughout the land; schemes to remedy our ills when put into execution are smashed like boxcars in a railroad wreck, and Wall street looks in vain for an excuse to account for the failure of prosperity to return since the repeal of the silver purchase act.